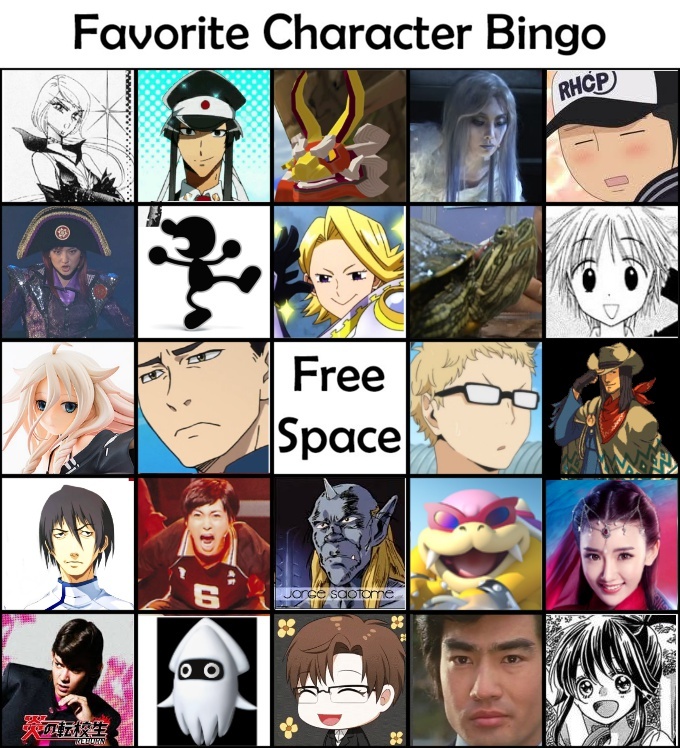 So I'm sure some of y'all have seen the Favorite Character Bingo meme going around! One of my friends sent me his and I was like UGH because that meant I had to do one! It was super fun tho, and I thought it'd be a fun thing to share here!! So here is mine!! I won't comment on all of them (because I could spend days talking about any one of them) but I do have comments on a few! I haven't seen or read any of BnHA. Aoyama is my favorite. I do not know what his quirk is! Please do not tell me!!! Serpen is actually my favorite character from myu but the pictures of Loof Merrow just look so much better. I choose that picture of Otabek because seeing that picture of Otabek was when I decided he was my favorite. Anyone with nostrils that defined is worthy of love. Did anyone get bingo? Or anywhere close? Also y'all should make and post your own cards! The template is here! Oh... i want to make one ! i will post here when i will finish ! Is it a character of gakuen alice in the last column ? He looks like the telepath . Who is the last man in the fourth column. That is indeed Kokoroyomi (mindreader-kun) from Gakuen Alice!! He’s such a funny little guy, he was an immediate favorite for me! And the last one in the fourth column is Hongou Takeshi!! He’s the first Rider in the Kamen Rider series. He’s a biochemistry major (like me!! ), is generally really cool, has a lot of existential angst over the fact that he’s a cyborg, and also he loves puppies. An all-around quality guy! I’m excited to see y’alls bingos as well!! 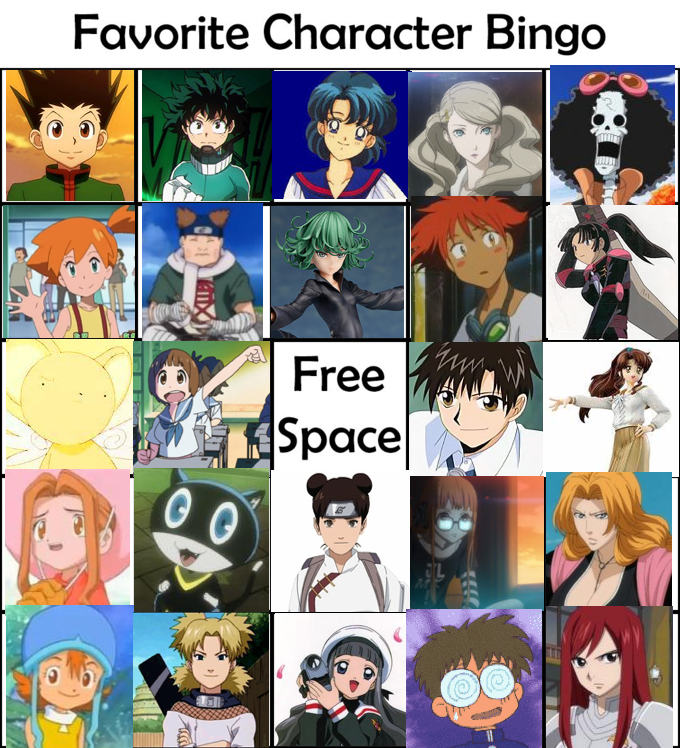 So...since I'm old and not up with the memes, the way I get a bingo is if I have some of my favorite characters on your cards? and then I make a card to see if you guys get a bingo? Yup! That’s exactly how it works!! 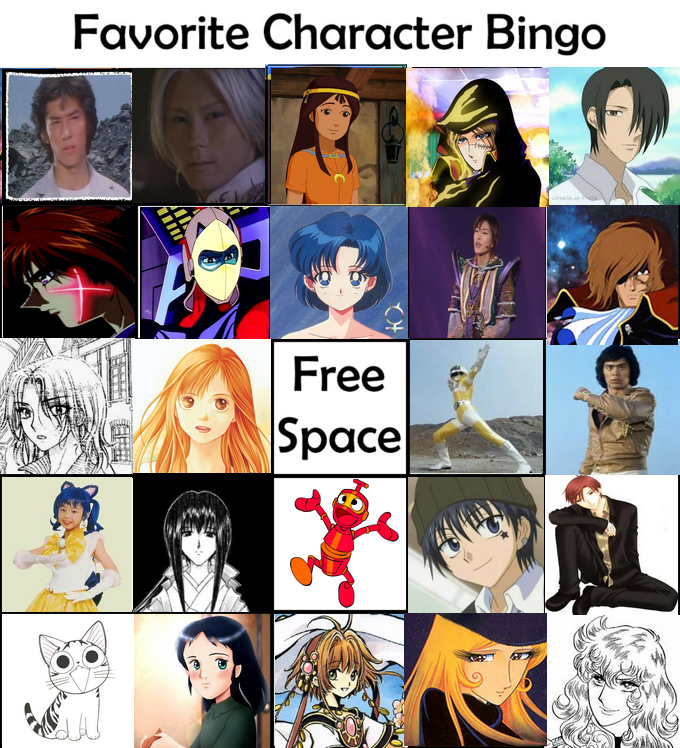 Given, I’ve literally yet to get bingo on ANYONE else’s card lol, but it’s fun to see how many of the people you know! I limited myself to 1 character per source (except for different versions of the same source), mostly to keep mine from being entirely Myu and Haisute, but lots of people include multiples from the same show! Sports.... ur reminding me again that I really need to watch HxH.... and BnHA.... I love that you have Umino lol, he’s so quality. Is the skeleton guy in the top right corner from One Piece?? Because if he is he’s from literally the only episode of One Piece I’ve ever seen. Oooh sounds fun! Maybe I will fill one out if I have some spare time! BTW, are we trying to stick to just anime/games/manga/myus or can some western cartoon characters sneak in? Yes! I made mine finally ! Sorry for resizing pictures... difficult. Oh sport ! I love Hunter x hunter too ! and Ondine ! 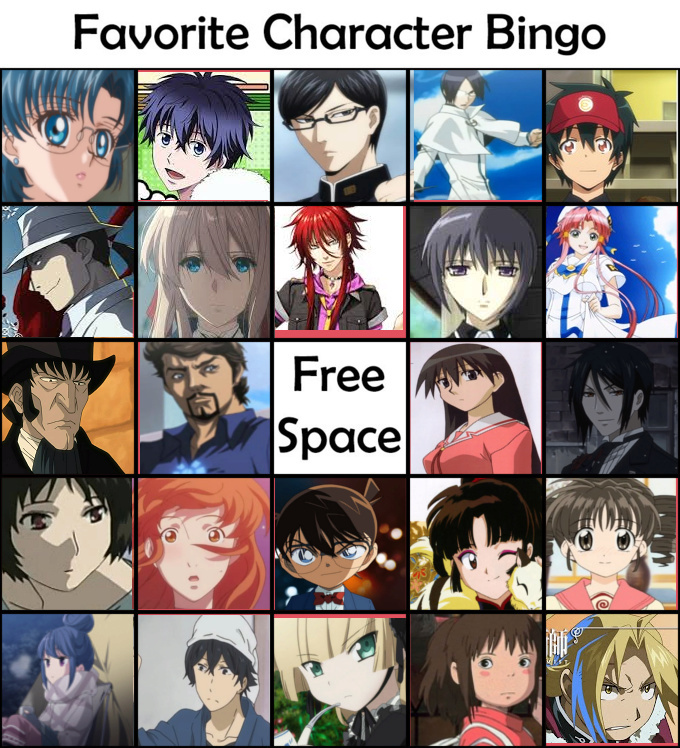 It took me a while to remember some of the animes and characters, but here's mine. I'm either drawn to the nerdy character or baddies.